Over the past week, two of the largest and most successful publishing houses in the country demonstrated that when one author becomes a big phenomenon, big sales -- and big profits -- are the end result. But when that phenomenon starts to wane, the red ink starts to creep into the black. Lagardere (LGDDY), the Paris-based parent company of Hachette Book Group, took a bit of a hit in its first half of 2010 from the inevitable drop off in sales from the juggernaut that is Stephenie Meyer's Twilight series. Last week, Lagardere reported "a limited fall in net sales" of 4 million euros, compared to last year's earnings of 542 million euros. The publication of a new Meyer novella, The Short Second Life of Bree Tanner, had only "a marginal effect" on total sales. 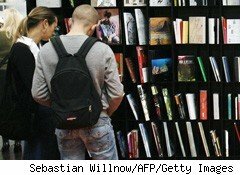 Net earnings also dropped from 112 million euros in 2009 to 101 million euros this year, and the company warned investors that earnings for the second half of the year will drop even more, thanks to further declines in Stephenie Meyer's book sales and a "less favorable than expected outlook" for their educational publishing units. Better news for the company came on the e-book front, where Hachette reported a 280% jump in digital sales compared to the first half of 2009, selling as much in the past six months as they did in all of last year. As for the entire company, Lagardere reported sales of 3.716 billion euros, and adjusted net income rose 20% to 97 million euros. For Random House, a division of German media giant Bertelsmann, there was no qualification of its good news: Sales and profits were up across the board for the first six months of 2010. Sales for the period ending June 30 climbed 8% (or 57 million euros) to 791 million euros, as operating EBIT doubled to 40 million euros. In a letter to the company, Random House CEO Markus Dohle cited the stellar performance of the U.S. division "which combined bestseller dominance with lower physical returns." That bestseller dominance owed a great deal to the success of Stieg Larsson's Millennium trilogy, which sold 6.5 million copies in America and Germany in 2010 alone. Dohle also cited Random House's "robust digital publishing momentum": It's worldwide digital sales are well on course to exceed $100 million. But what of the next six months? Dohle, too, wonders what's in store. "Can we maintain, and even improve upon, our first-half sales and operating EBIT in the second half of this fiscal year? ", he asks. "Still too early to tell. We continue to get a lot of mixed messages about consumer spending, which is uneven; consumer confidence, which is uncertain; and the economic recovery, which appears to be long and slow." Nonetheless, he points to some key fall titles, such as George W. Bush's Decision Points, John Grisham's new legal thriller The Confession and Jay-Z's Decoded for potential sales boosts. As for the parent company, Bertelsmann reported "a surge in profits" for the first six months of the year, with a "new record" operating EBIT of 755 million euros on sales of 7.4 billion euros.